Feminist solidarity and collective action are both aims in their own right, and ways of working to attain gender justice and women’s rights, not only in developing countries but in the global North. 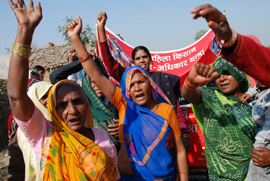 In this issue of G&D, articles from researchers, activists and practitioners focus on how the ideals of the feminist movements have been heard, absorbed and responded to by development and humanitarian policy and practice: both as ends in themselves, and as critical elements in the process of attaining economic, political and social rights for all. For free access to the articles in the Feminist solidarity and collective action issue, please visit the Publications section of the Oxfam Policy & Practice website, and search the site using the article title or author name. You can access the Introduction and the Resources and Book Reviews sections for the Feminist solidarity and collective action issue, free, below.